About the project Little Italy, hosted by Unfolding Pavilion, curated by Davide Tommaso Ferrando and Sara Favargiotti, for the Biennale di Venezia 2018. 16th Architecture exhibition, we were invited to think about the theme of architecture’s fanzines. The focus of Little Italy’s project is mapping and investigating the independent editorial realities, from Italy to Europe. Starting from twenty-three fanzines’ archives we were invited to design a poster using the collage’s technique. The focus of this poster is to trace a contemporary panorama of the fanzines. From the beginning, we understood the complexity of the editorial works behind these products and we focused on the concept of the fragment, like the “remaining of a system”, like the memory of these processes. The fragment is also base unit of the collage. In architecture’s fanzines, collage is the main tool for architectural representations; by his nature, the collage has an heterogeneous language and together It creates homogeneity: the fragments remain distinct from each other, but create a unitary system linked to an imaginary and a vision, common and against in most cases. Starting from the use of the fragments we decided not to choose; in the organization and in the editing of the fanzines’ archives the choice had already taken place. This choice is about the selection of the elements that will be, in future, the generators of new contents, the fragments and their system should live together in a different way. The fragments can be memory, future’s projection, experience but also simple objects functional to the idea of the collage, instead the message is driven by the compositional logic. 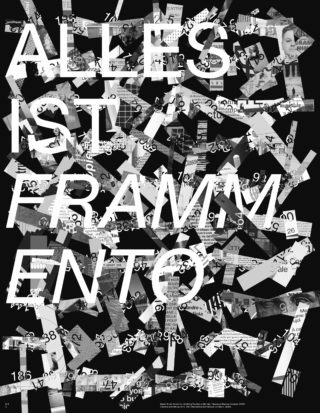 Our approach, intentionally not curatorial nor illustrative, brought us to generate in a random way a visual archive about the fanzines’ language. Fragments of texts, titles, images and collages, put together, in conditions, like form, dimension and a closed space-time range, give us a vision about the contemporary panorama of the archizines. We assigned a numerical value to each file, from 1 to 187. The sequence, the position and the order of the fragments are created by code trough the assignment of parameters to underline the conditional construction of the system; the elements are re-built in a new democratic combination.